South Korea's electric vehicles sales surpassed the 10,000-mark for the first time ever in the January-June period on strong demand for such cars as the Ioniq and Bolt, corporate data showed Sunday. 2018 stood at 11,866 units, roughly equal to the total sales tallied for the whole of 2017. Last year, EV sales reached 4,412 in the first six months and the annual figures hit 13,536 vehicles. This year's number does not take into account sales by Tesla Inc. and small local carmakers, which do not provide information on vehicles they sell. Many auto industry experts estimate actual sales probably exceeded 12,000 cars as of June 30. "The growth in the past year can only be described as explosive," a source for Hyundai Motor Co., maker of the Ioniq, said. By model type, sales of Hyundai's Ioniq reached 4,488 units for a market share of 38 percent, followed by the Chevrolet Bolt from GM Korea Co. at 3,122 cars, representing 26 percent of the market. In addition, sales of Hyundai's Kona EV totaled 1,380 units, placing it third, even though the small crossover zero emissions vehicle only reached local dealerships in May. Hyundai said the waiting list for the electrified Kona stands at 15,000 units, a clear sign of the car's popularity. i3 EV and the electric version of Kia's Ray mini boxcar. Market watchers said that while South Korea's EV sales got off to a slow start selling only 61 vehicles in 2010, numbers have been rising sharply, hitting 1,308 in 2014 and 5,099 in 2016. In particular, with more EV models -- like the Niro EV -- to be launched in the second half of this year, there is a good chance that total number of such vehicles could exceed 20,000 by year's end. 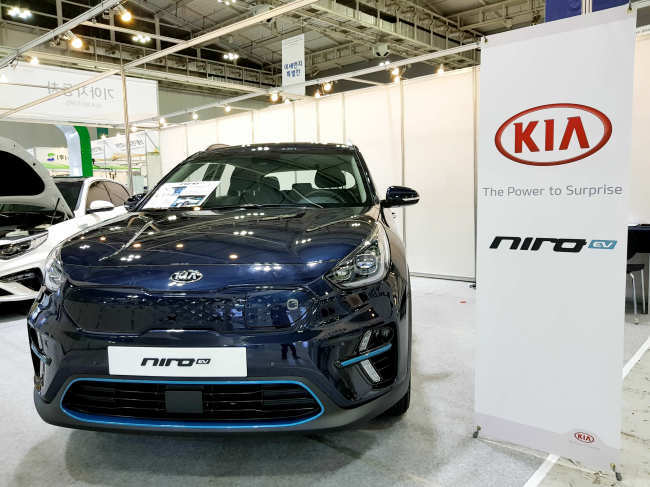 Kia's new Niro EV has been rated to travel 380 kilometers on a single charge and its pre-orders have already surpassed 5,000 units, the carmaker said.